The other day I was talking to a builder who was working on our new village hall, it was lunch time and he was tucking into a Ryvita. It looked like a sesame one to me. I must have looked a bit perturbed as he asked me what the matter was. ‘You’re eating a Ryvita’ I said (it didn’t even have any butter on it). He looked defiant and said that he was a new breed of builder and was looking after himself. I’m all for people looking after themselves but as Mr Clark rightly points out, Ryvitas taste of cardboard. Nowadays I only eat them if the cheesy oatcakes have run out. It got me thinking about breeds of builders because to my mind there is actually some truth to it. 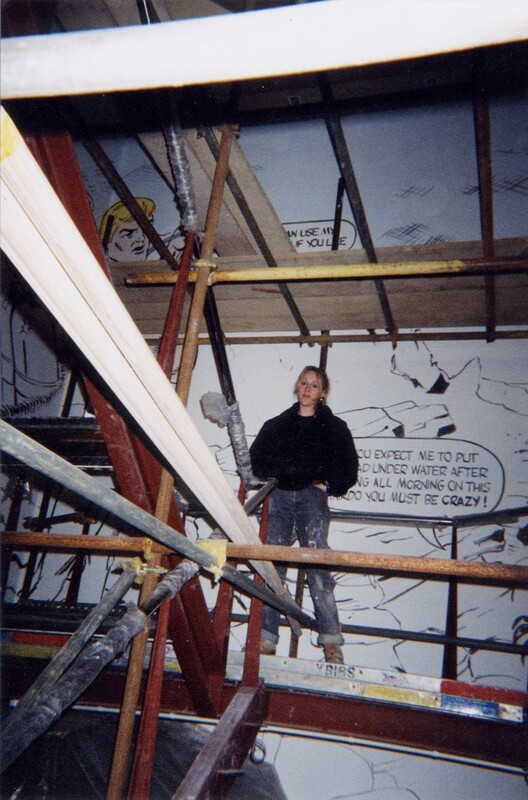 I used to work on building sites all the time when I was a mural painter, back in the old days before I built a house and had a creaky body. I worked for Fullers Brewery painting murals, mostly in London for their pub and hotel refits, you should have seen me swing from the scaffolding like a paint covered monkey. When I first got to the site, the plasterers and plumbers would have already gone, and the chippies would be working away alongside the electricians and painters. They would eye me up suspiciously, being wary of arty types – especially designers and thought I would be snooty and demanding. They would tell each other off for swearing as there was a lady present; so the first ‘f’ word that accidentally slipped out, I would shout ‘don’t’ ****ing swear!’ and laugh my socks off at their shocked faces. It broke the ice anyway and then I’d make everyone a cup of tea. We’d all get along famously after that … and sometimes they would even make me a cup of tea. If I carried on swearing they would label me a ‘potty mouth’ and tell me off as it wasn’t ladylike. The chippies could almost always sing and whistle in tune. They were normally the best looking too, but you weren’t to let them know – that would be foolish. The electricians were very quiet and shy on the whole; really decent people and not sweary at all. Painters would be funny and crack silly jokes, they’d come up to me and say ‘ you missed a bit’ just to get their own back on everyone who did it to them I suppose. Most of the builders were from up north so were staying in digs in London in the week and going home at weekends. They would turn up in the morning a bit the worse for wear for a few pints in the pub the night before, but being young meant that they could cope with a hangover. Most of them had made sandwiches which I thought was amazingly organised. Not a Ryvita in sight though. This was the nineties however, I don’t really know when men started describing themselves as ‘new men’ and began using moisturiser. I’m still reeling at the shock of seeing Hugh Laurie advertising men’s skin products. When Mr Clark and I built our house I knew about these breeds of builders, but was involved in dealing with them as their site manager – a completely different scenario. There wasn’t the ‘us’ and ‘them’ camaraderie as I was the ‘them’ but also had to be one of the ‘us’ at the same time – a tricky line to tread. There was always Mr Clark to be the ‘them’, and I’m afraid to say I would use him as the fall guy. Always blame the one who isn’t there at the time, that’s what I say. This entry was posted in Site management, subcontractors and tagged Builders, building, building sites, fall guy, Fullers Brewery, hangover, Hugh Laurie, London, lunch time, men's skincare products, moisturiser, murals, refit, sandwiches, scaffolding, site manager, subcontractors, swearing, tea, trades, us and them on 1st November 2015 by Mandy Clark.